Once more, dear friends, into the breach…. In my first post here I said that I was going to be teaching a Korean history course for the first time: I lied. Or rather, I was scheduled to teach it, but the course didn’t make its minimum enrollment. However, the time has come to try again. The last time I did this, I was going to focus it on upper-level undergrads and make it as much about primary sources as possible. The only four books I’d ordered were Korea Old and New: A History (Eckert, Lee, Lew, Robinson, Wagner), The Columbia Anthology of Traditional Korean Poetry, and the two volumes of the new Sources of Korean Tradition from Columbia.1 Ambitious and, apparently, off-putting in the extreme. I’m torn, really, on the question of whether to teach a “Rice Paddies” style course — all of Korean history in a single semester — or break it up (as I have my China and Japan courses) into pre/post 1700 (and start with the later one, which should draw more students at first). If I teach the whole history, I might well keep the poetry — I do poetry in my China and Japan courses, and the Korean stuff is lively and diverse — but I can’t see using the Sources sets as-is. This time I want to pitch the course much more broadly, and draw in some of the business and language students — Koreans actually make up one of our largest groups of foreign students, and our business department has a long-standing interest in Korea — so that the course really does reach critical mass. So I’m thinking that the heavy dose of Columbia primary materials is probably not a great idea. That said, I prefer to have students read primary materials as much as possible, or ethnographic-style observations, or historical scholarship which evokes a clear and detailed recreation of a moment or era. I’d love to hear thoughts from our readers about what works and what doesn’t, what’s come out recently that’s good for students, and especially if there are better textbooks at this point. Update: I just ran across Kenneth Robinson’s Korean History Bibliography, which looks like a great starting place. I was very saddened to hear that Professor James Palais has died. Everyone in the world of Korean history will have heard of him and anyone who has read any of his books and papers will know that his scholarship was at a level that leaves you in awe just a few pages in. Unfortunately, many of us at a relatively early stage in our studies will never have the opportunity to meet Professor Palais. There is a rather perfunctory obituary from Yonhap. 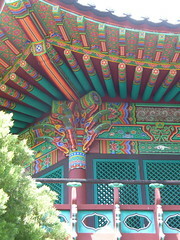 Hopefully there will be something more substantial soon via the Korean Studies discussion list which I will post here. In the spirit of cross-linking, back-linking or something like that, here’s Antti’s post on the death of James Palais, which links here and also includes more interesting links to obituaries and the personal reflections of people that knew him. A bit of a change of pace here, but I thought I’d share a bit of the information I’ve gathered from working on cataloguing Korean books in the library here at SOAS. Of course if you are uninterested in premodern Korean history or have a low boredom threshold this would probably be a good time to click away. 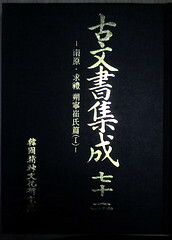 I’ve posted before about accessing the major Chosŏn dynasty annals online. These have formed the backbone of studies on premodern Korean history during the last few decades, but now it seems the emphasis is moving toward more detailed research using archival sources. 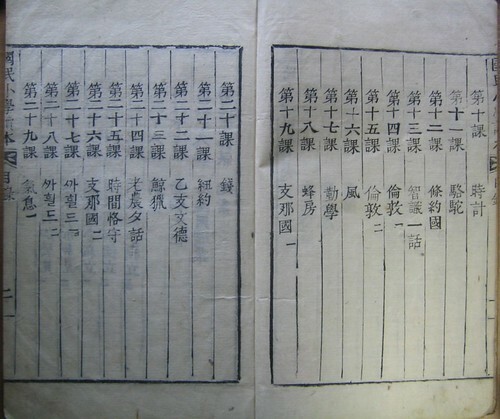 What I mean by archival sources are all the surviving public and private documents from the Chosŏn period that tend to be called komunsŏ (古文書) in Korean. 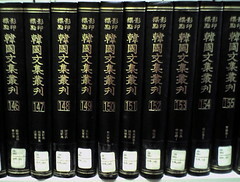 These sources are becoming increasingly available to researchers through a number of massive compilation and publication projects being carried out by some of the main organisations in Korea responsible for promoting the study of Korean history: namely the Academy of Korean Studies (韓國學中央硏究院); the National History Compilation Committee (國史編纂委員會); the Kyujanggak library of Seoul National University (奎章閣); and the Korean Classics Research Institute (民族文化推進會). Below I will look in turn at the collections that each of these institutions is publishing and what they offer for historians. If anyone knows of any important ones that I have missed out, please feel free to let me know in the comments. A very impressive collection of archival materials, often from the archives of individual clans/families, now at volume 76 and counting. It includes mainly facsimiles of the originals but also some transcribed versions too. Another very important collection which seems to have reached volume 36. The materials appear to be similar to those in the Komunsŏ chipsŏng collection but I think in this collection there is a greater preponderance of reprinted old books and diaries rather than komunsŏ as such. 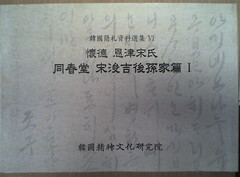 Among recent volumes are two covering the archives of the Pak family of Matjil village in Kyŏngsang province upon which the groundbreaking book ‘The Farmers of Matjil Village’ (맛질의농민들, 2001) was based. A series of volumes of collected letters including quite a lot written in han’gul (called ŏn’gan 諺簡) which could be very interesting for research into Chosŏn social history. Seems to have reached at least volume 6. This collection appears to be quite a diverse collection of historical documents, including many that are kept in collections outside of Korea. It turned out to be very useful for me as I discovered a whole new cache of documents relating to the topic of my thesis in one of the volumes dedicated to materials kept in Japan. It is also particularly great because most or all of these materials seem to be available online here. Straightforwardly enough, this is a series of collections of komunsŏ from the Kyujanggak archives. As one might predict, considering this was once the royal library, about half of them consist of collections of government documents. You can find some more information about the contents of the volumes here. Another couple of volumes of materials from the Kyujanggak archives. I’m not sure whether this one really fits in this category, but it is certainly a publication mega-project that dwarfs the others, being a comprehensive collection of the collected works of Korean literati, or munjip. On the basis of the holdings in our library it seems to have reached volume 301, but it may have got further than that by now. The Korean Studies mailing list has been full of people’s recollections of the the Koreanist Fuji Kawashima of Bowling Green State University, who died recently. If you are not on the list and want to read what people are saying you can look here. There is also an obituary here. At my own blog I’ve been writing a series of posts about some interesting old Korean books I’ve come across in the library of the School of Oriental and African Studies. This is actually no. 5 in that series, but I thought that it would be worthwhile crossposting it here. A list of the previous entries in the series can be found at the bottom of this post. 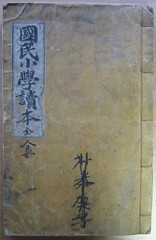 The book in question is probably the first modern textbook produced in Korea. 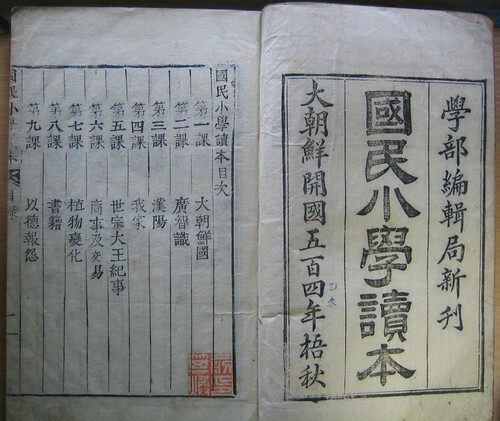 Entitled An Elementary Reader for Citizens (國民小學讀本), it was first published by the education ministry of the country that was then known as Tae Chosŏn’guk (‘Great Chosŏn Nation’) in 1895, or year 504 of the dynasty, if you use the short-lived dating system that was current at the time. A facsimile edition was published in the 80s which still seems to be available at secondhand bookshops. It is certainly a book that I’d like to get around to looking at in greater detail. The first attempt at creating some sort of general, state-led educational material in Korea must have echoes that can be seen and felt even today, 111 years later. It is also fascinating to see what these early educationalists thought was important for the citizens of Chosŏn to know about. And some of the language used, even in the chapter headings, is interesting too, like the use of the word Chinaguk (支那國) for China instead of Chungguk (中國). The title page and first page of contents. It has been brought to my attention that historians of premodern Korea have a very special Christmas treat in the form of the annals of the Chosŏn Dynasty (Chosŏn Wangjo Sillok / 朝鮮王朝實錄) now available on the internet, in its entirety. This must be one of the largest ‘books’ in human history and it is now available online in both original hanmun and modern Korean translation. And it’s keyword searchable too. Following up on Owen’s very useful posts, I’ll write a few words on finding Korean journals online. I have used the RISS site a lot and they do have an option for foreigner users now, but there is a snag if you want to download articles for which you have to pay. This used to be possible by using a credit card and the prices were reasonable, between 2ooo to 4000 won per article, depending on length, journal and newness. About a year ago, however, when the site became more friendly towards those unfortunate souls without a Korean ID number, it also became impossible to pay with foreign credit cards. I don’t think the site itself has any control over this, because they use a widely used plug-in from a large electronic banking company. Anyway, it has become impossible to charge non-Korean credit cards. The last time I tried was about four months ago. As for obtaining articles for which you should pay, the best way is still to ask someone on a Korean campus. As most Korean universities are subscribers of journal article databases, anybody with a campus ID address can download any article they require. This is probably also the best way to get hold of unpublished MA and Ph.D. theses, although for those you need to have an ID address of the university where the particular thesis you want was submitted. Complicated, but often worth it. Following the lead of Konrad I thought I might start off my posts with something about finding Korean history resources online. It is now actually possible to do quite a bit of research, even on pre-twentieth century primary sources without getting up from your computer (whether this is as interesting as searching stuff out a library or archive is quite another question). Of course the biggest advantage of these sources being online must be for people who are physically a long way away from a library that holds, say, a copy of the massive Sŭngjŏngwon Ilgi 承政院日記 (Daily Records of the Royal Secretariat). Thus, with a decent internet connection it should now be possible to live in Zanzibar and research 18th century Korean political history. A second advantage is the ability to search for keywords within these massive texts. 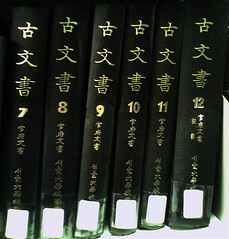 Some of the physical editions of the Chosŏn government annals do have indexes, but searching a text online is much quicker and more precise (bearing in mind that these books run into hundreds of volumes and looking things up from an index means continually pulling different volumes off the shelf). So far, the site I’ve made most use of when searching pre-twentieth century sources is probably Seoul University’s Kyujanggak Library website. 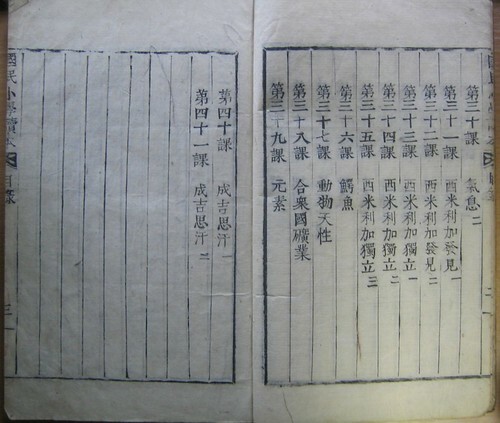 Here you can do a simultaneous search for keywords in a number of different categories of sources, including kodosŏ, komunsŏ, modern government records and two different Chosŏn government annals: the Ilsŏngnok 日省錄 (Records of Daily Reflection) and the Naegak Illyŏk (Daily Records of the Kyujanggak). The Kyujanggak site also has two further annals online in scanned form: Sŭngjŏngwon Ilgi and Pibyŏnsa Tŭngnok 備邊司謄錄 (Records of the Border Defence Command), through which you can browse but not search. The National History Compilation Committee (국사편찬위원회) website does have a searchable digitised version of the Sŭngjŏngwon Ilgi online, which I’ve found to be quite easy to use. And the Korean Classics Research Institute (민족문화추진회) appears to be gradually uploading some sections of the modern Korean translations of the Ilsŏngnok and Sŭngjŏngwon Ilgi that have been coming out in book form over the last few decades. So far they have a few years of Chŏngjo’s reign for the Ilsŏngnok and years 1-35 of Kojong’s reign for the Sŭngjŏngwon Ilgi. The Korean History Data Integration System (한국역사정보통합시스템) is supposed to be a way of bringing all these different online sources together in a single searchable database. I found it quite hard to use for a while, but it seems to have been improved quite a bit recently. Basically it allows you to search all the sources on the sites mentioned above and quite a few more sites besides. One word of warning on all these sites: they don’t seem to be very Firefox-friendly and like some other Korean websites they can be messy to navigate and require you to download some piece of viewing software or other. Oh, and they seem to love pop-ups too.